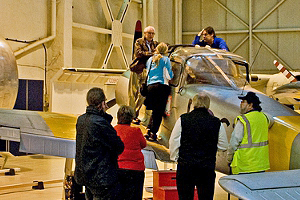 The Open Cockpit Nights at Cosford have become so popular they are now held at least twice a year. Tickets, with the proceeds going to the RAFB Fund are normally snapped up some weeks before hand so, at a modest price of only £10, make sure you order in plenty of time. 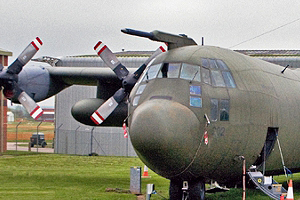 The first thing you spot, as you arrive at Cosford is one of the latest and largest new exhibits, the C130 Hercules. I took a few photographs and then spent a considerable time in Photoshop taking out all the fluorescent cones some Health and Safety conscious person had put around the aircraft! I must also admit to cheating a little. With the ticket allocation being relatively small, to avoid queues into the open cockpits, I also took the opportunity to take some shots of other exhibits without too many people in frame. 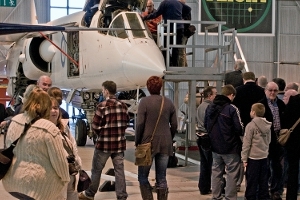 Talking of queues – yes there were a few, but the museum had chosen to open cockpits of aircraft in different exhibition hangars which reduced any waiting times to a very acceptable few minutes. Unfortunately, I was having an “off day” with my health and felt it wiser not to attempt to climb into any aircraft. 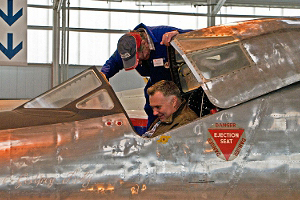 The “in” bit would have been no problem but the “out” bit may have been more difficult and I had no wish to delay the pleasure of other visitors or, for that matter, rely on the help of Martin Baker to extricate me from an aircraft! Several of the attractions were as popular as ever. 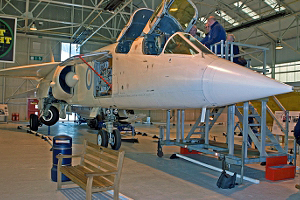 The ever “technically advanced” TSR2 received more than it’s fair share of attention and she still looks as though she was well ahead of her time. 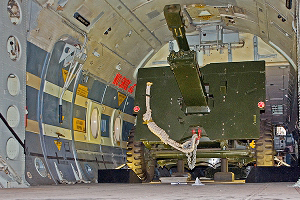 Except, perhaps, for her avionics – I don’t think I have seen so many hatches and covers open at one time and the equipment they contained was the only real clue to the actual age of the design. 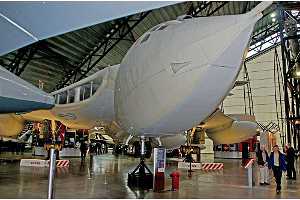 I remember the day of the announcement of its discontinuation having a personal effect on my father who had worked on the TSR2 Project at the Royal Radar Establishment at Malvern. 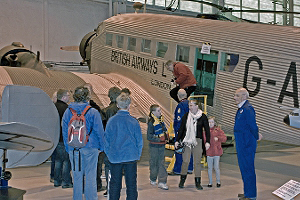 The Junkers JU52 also attracted a lot of interest. Although this is a “British Airways” example, I am sure that many visitors, upon spotting the unique corrugated fuselage, immediately associated it with being the aircraft favoured by Hitler as he travelled around his 1000 year Reich. The Bristol 188 cockpit played host to many that night though what must have been a mirror polished fuselage when she was built, now proudly bears the dents and scars of its age as can be seen in the photo. 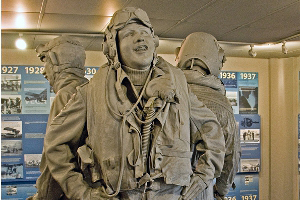 In the Cold War Exhibition Hall, visitors could choose to sit in a Mig or any one of several Nato aircraft cockpits and when you consider that volunteers are needed to explain the aircraft and take care of visitors, you begin to realise the commitment of the Museum members in sharing their passion for caring for these historical and iconic aircraft. 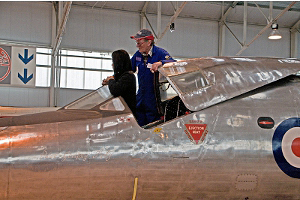 Even aircraft like the Pembroke and the Provost received attention from the youngsters who will make up tomorrow’s generation of aviators – some perhaps, inspired by what they saw, will go on to achieve their goals and ambitions in aviation. 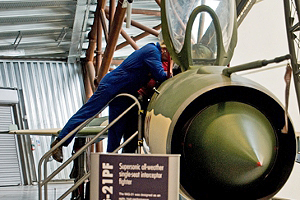 If you want to get close up and personal with aircraft, then, I recommend that you attend one of these Open Cockpit Events and, if you have not been to Cosford before, take the time to have a quick look at some of the other exhibits that surround you. 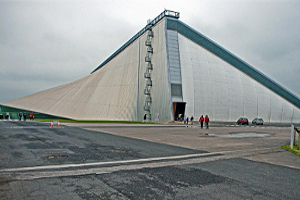 And, come back to Cosford on a “normal” day - happily immerse yourself in the world of aviation for a few hours until you come down to earth with a bump as the wife reminds you that the Supermarket is beckoning and that “lawn won’t cut itself”.